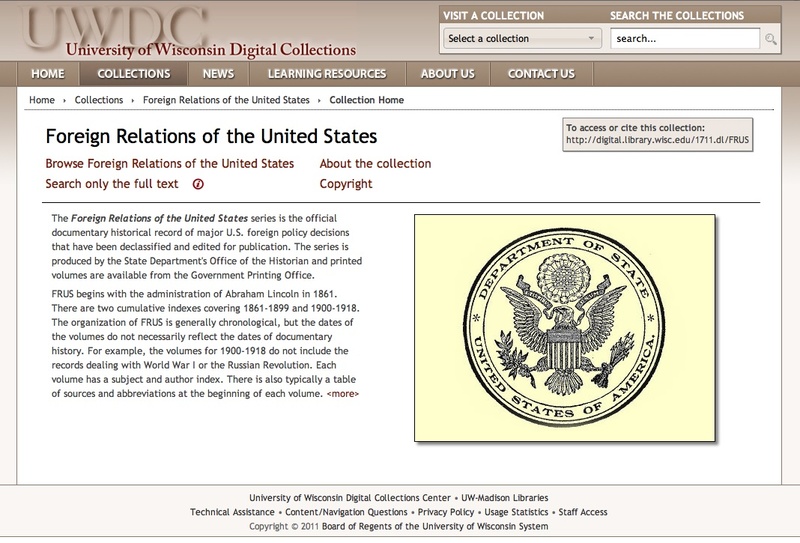 Foreign Relations of the United States (FRUS) is a project of the University of Wisconsin-Madison Libraries in collaboration with other universities and libraries giving online access to the official documentary historical records of US foreign policy decisions. Produced by the State Department’s Office of the Historian, the website’s contents consist in the major American foreign policy decisions and represents a good point of reference for historical analysis of US foreign policy. Digital books covers the range from 1861 to 1960, beginning with the Abraham Lincoln administration. In a simple website structure presenting basic tips for quick navigation, more than three hundreds volumes are provided in image format with tables of contents and in-depth info on their subject, authors and dates of publications. Although items downloading is allowed only through webpage saving, this website gives access to text or print versions of selected documents. According with the project’s mission, aiming at reducing the digitization’s costs, the FRUS website’s contents are given completely free of charge. Images, texts, and other contents downloaded from the collection may be freely used for non-profit and research purposes. An added value is represented by search feature including explanatory help pages and print facilities. are websites collecting highly specialized materials in different formats, which may vary from electronic releases of out-of-print book collections – as it is the case with Gallica - to unpublished conference proceedings, as with Political Research Online, a website promoted by the American Political Science Association to gather, organize and publish research papers, abstracts and articles by emerging scholarship worldwide.